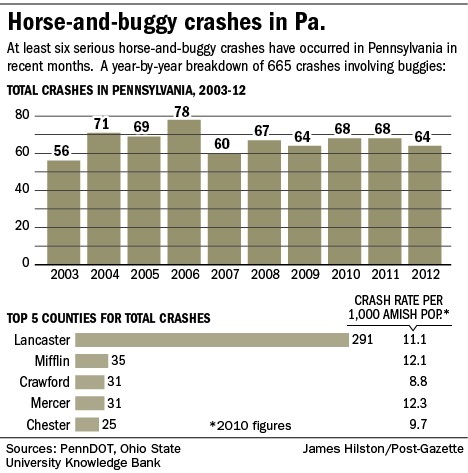 The Pittsburgh Post-Gazette has put together a graphic showing the number of buggy crashes in Pennsylvania since 2003. The chart displays year-by-year accident totals as well as crash rates for a number of counties with a significant Amish population. Over the past decade, 2006 saw the most accidents, with 78. The fewest were recorded in 2003, with 56. The chart accounts for 665 crashes though it’s not clear how many might be unreported here. Since the beginning of October there have been “at least five serious crashes involving buggies in Pennsylvania”, leading to three deaths (crash count updated to reflect corrections in original story). Buggies travel deceptively slowly, something to remember if you are driving in Amish areas. Curvy roads, hills, and dangerous passing decisions present further hazards. I try to be mindful when driving over hills especially. You never know what might be on the other side. Chances are a buggy has just crested and is descending slowly, just out of view. Hilly, potentially dangerous terrain is common in a number of the larger Amish communities, including Holmes County and Lancaster County. Traffic accidents are always a sad thing, but motor vehicle/buggy are upsetting. I have talked to many Amish in Western New York who merely say that “It is God’s way.” I don’t know what the solution is. Living in the country, I’m always mindful of what may be just over the hill when driving… especially during planting and harvest seasons. Although I do not live near any Amish communities… I would imagine this to be a heart-wrenching situation for all involved. I’m interested in learning more about the causes of these buggy accidents. Is there any way you can get more details about these statistics, Erik? The chart says the source is the Ohio State University Knowledge Bank. I tried to search for more information on the internet, but wasn’t successful in finding anything. Al here is an article by Cory Anderson about causative factors of these crashes. Online you can sometimes find good articles on Amish topics using Google Scholar. you look very familiar with amish communities. Could you please help me to find a traditional one? Traditional means for me no BMW in the garage and no generators in the barn. My friend from Europe would like to contact them by mail (of course traditional ones don’t have e-mails), because he is looking for his amish roots. I’m planning to go to New Wilmington to find them. Do you have any better suggestion? People are in such a hurry these days behind the wheel. I was following a buggy waiting until the opposite lane cleared so I could pass. The car behind me couldn’t wait, but didn’t see the buggy ahead of me. He passed me and almost pulled in where the buggy was. He did make it around the buggy without hitting it. Where he did this the road was solid lines on both lanes with cars coming in the opposite direction. You wonder about people driving on the roads sometimes. Indeed you do, Marilyn. Why are people so anxious to “save” a few seconds by taking foolish chances? No Amish buggies around here in suburban Washington, DC, but some people take stupid chances every day, causing fender benders and worse. What I would said about the cars’ and trucks’ driving habits would not be very Christian like I am afraid, hehe. I live in a very high traffic area – metro NYC. Life in general moves way too fast anymore. People in a hurry to go no where. People beating people up over discount TVs instead of spending time with their family enjoying a bountiful meal. People hurrying by an injured woman who has fallen on the ice and can not get up (my own personal story there – me being the injured. Thank God for the marines who can and helped me up and got me to my car safe). People being lazy and selfish – backing up a drive through line into traffic instead of just parking quick and going in the store .they would rather make other people late just so they can get their darn coffee. People who let their kids run amuck and face injury or abduction while they sit and text or talk on their cell phone because that phone call just cant wait. Christine, I hate to say I can relate 🙂 Plenty of good people in the city, but at the same time the environment of large cities probably encourages some of the behaviors you describe. Might be one reason Amish don’t want to live in cities. Although visiting NYC for a day last year was a thrill. I’m guess the Amish family that was on the train back to Lancaster with me enjoyed their visit as well. Well if you come this way again, let me know. We’ll have a family picnic/fishing day at the park and pretend we arent in the city! I came across this site that tracks buggy accidents from all over. Maybe you can find some benefit from it. You were talking (I thought) about turning off your lights when you pass a buggy. I assumed, maybe wrongfully so, that you meant “passing” as in overtake a buggy going in the same direction as you are going. In that case the lights are not in the horses eyes directly. Also many horses are fitted with ‘blinders’ to help keep things out of the sides of their eyes that might distract them. I understand your thoughtful motivation in turning off the lights. I will have to ask my Amish friends what they would prefer. And if you meant when passing in the direction *of* the horse, I definitely wouldn’t be turning of my lights. Turn off the brights yes, but they have to see where you are, and are used to lights from road traffic. Generally, I don’t think it is a good idea to turn off headlights in any nighttime situation on the road. No telling what else is just ahead. Tom, thanks for that link. Just reading about a few of the reported accidents gets my BP up! It’s especially infuriating when I learn about people using their “smart phone” while they’re driving. Too bad people can’t be tested (as being “smart enough” to use them appropriately). The photos are awful reminders of the difference between Amish (slow-moving) and English (moving at warp speed). God help us all! Thanks for your article, Erik. How do these numbers compare with other crash statistics, like motorcycles, or bicycles, or car with car in the general society population? I do like the buggy lanes on the road shoulders that are available in some communities. According to the U.S. National Highway Traffic Safety Administration (NHTSA), in 2006, 13.10 cars out of 100,000 ended up in fatal crashes. The rate for motorcycles is 72.34 per 100,000 registered motorcycles. Motorcycles also have a higher fatality rate per unit of distance travelled when compared with automobiles. Per vehicle mile traveled, motorcyclists’ risk of a fatal crash is 35 times greater than a passenger car. An Ohio Department of Transportation review found that injuries occurred in roughly half of those accidents, with fatalities in about 1 percent of them, a rate that is slightly higher than accidents in which both vehicles are motorized. That review also revealed that the typical accident involving a horse and buggy occurs when a motorist rear-ends the buggy after misjudging just how slow the horse-drawn vehicle is traveling. Self driving cars can’t come too soon, because no matter how much the ‘puters screw up it will be a fraction of what humans do. I’m 43, and I think I’ll live to see human-operated vehicles at least prohibited from limited access highways (like Interstates) where you’d see an enormous increase in capacity and reduction in accidents by all the cars operating cooperatively. It’s not uncommon in luxury cars already to have “adaptive cruise control” where the cars adjust their speed automatically to maintain a self following distance when in cruise control. The self driving cars will also have both radar and infrared camera systems which will allow them to “see” at night and in fog a letter better than people do. why cant they be courteous? Shut your lights off? I am not sure what good that does. Having the lights on alerts oncoming drivers, that you might not be aware of, or people walking or riding a bike on either side of the road. Your lights illuminate not only your path but that of the Amish people as well. The Post-Gazette article is incomplete at best. Their graphic makes reference to “six serious horse-and-buggy crashes in recent months”, and rolls that into the figure of “Over 600 Pennsylvania Buggy Accidents since 2003” without breaking down how many of the larger number were considered “serious” accidents. What criteria determines a “serious” accident? Is it death and/or personal injury, dollar damages, or a combination thereof? Did all of the “Over 600 PA Buggy Accidents” involve a buggy and a motor vehicle? Were any of them two buggy collisions? What about single vehicle accidents, where e.g. a spirited or spooked horse ran away and flipped the buggy — or a buggy had a structural failure of some sort, or was driven into a roadside ditch, or an occupant fell from a moving buggy (I’ve seen teenagers standing on the backs of moving buggies). From most accounts and the studies referenced in the article, the majority of “serious” buggy-motor vehicle accidents seem to involve the buggy being rear-ended by the motor vehicle.